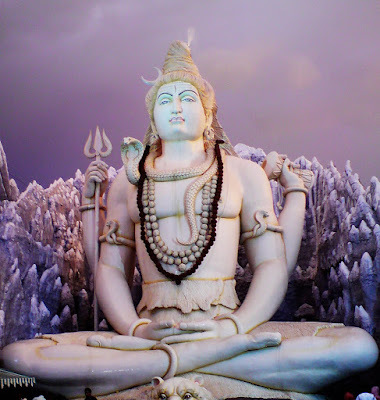 Its feels little strange to have a post with the title "mandir" in my blog. but still, it does not feel any odd to write about it. Yesterday i went to this temple, near the old HAL airport. Actually i was accompanying my friend, who wanted to go to this temple (its very rare for me to accompany someone to 'Temple', unless u're like a celebrity to me. Most of my friends will know, how hard it is to make me accompany them to go to Temple, and eventually they can't). I usually go for little walk in the same road, and never knew where exactly this one is located (honestly, never bothered to know). so, took an auto from domlur fly-over and the auto driver stopped the auto, showing the entrance, in less than five minutes from the start. i said, "I have crossed this place for atleast 30rty times, but never knew that such a temple exists here", as we cant see the Big statue from outside. Entered through the small cave like entrance, and finally could have a glimpse of that huge statue. Overall , It was very nice place to be. And i feel like, you need to go when there is not much crowd, to enjoy the place more, both visually and spiritually. But dont miss this place, when you're in bangalore.